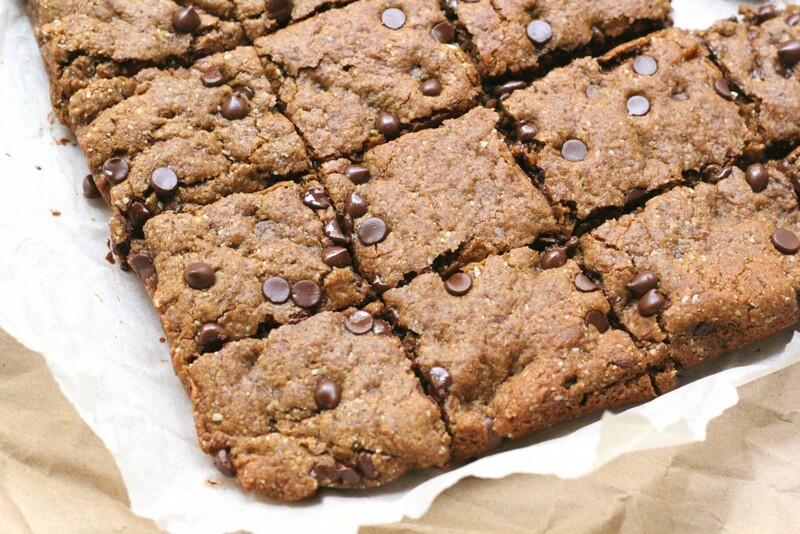 These Healthy Chocolate Chip blondies are the perfect amount of super chewy, crispy on the outside as well as thick, goeey and slightly soft in the middle to balance them out. They make an awesome dessert or mid-afternoon snack. Soo I was going to share a bright and tasty Summer salad with you guys today but I asked you on Instagram which recipe you’d rather see today and these Healthy Chocolate Chip Blondies won by a landslide! 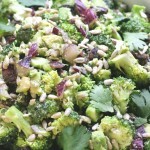 Stay tuned for one of my favorite, everyday salad recipes I’ll be sharing with you in a couple days. I’ve been working on these Healthy Chocolate Chip Blondies for awhile and I finally made a recipe that I loooovee and got J’s stamp of approval last night when he came home from work. I’ve been waiting to share this blondie recipe with you until I achieved the perfect amount of super chewy, crispy on the outside as well as thick, goeey and slightly soft in the middle to balance them out. 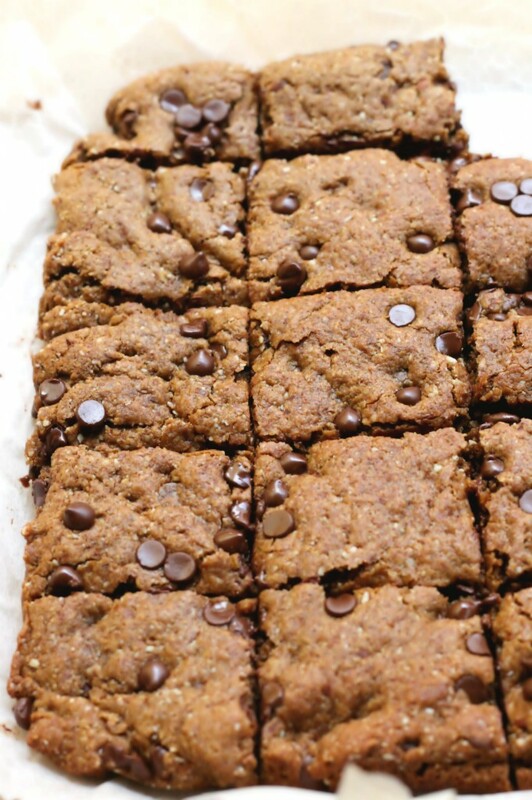 I also wanted to make these Healthy Chocolate Chip Blondies gluten free because I know a few of you have been requesting more gluten free recipes lately! 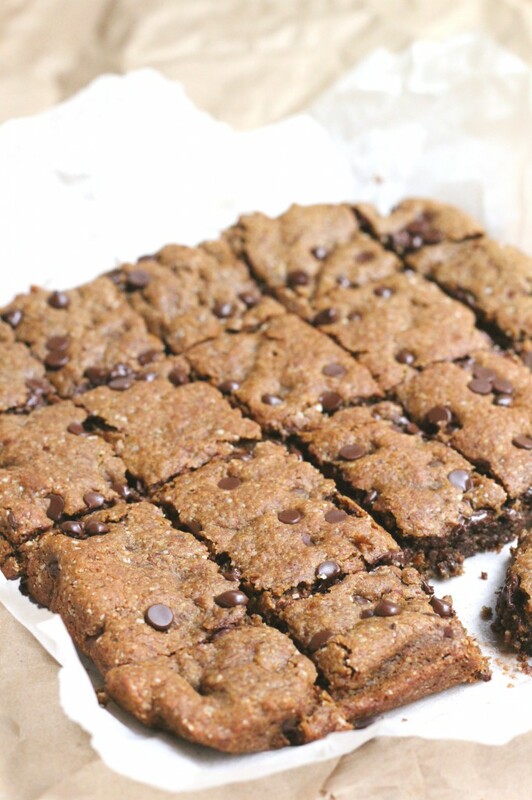 I made these Vegan Healthy Chocolate Chip Blondies yesterday before going for a run. I was rushing to get them in the oven and in the process spilled my new cacao powder all over my running pants (can we all agree, spilling expensive baking ingredients on yourself is the worst). I brushed the cacao powder off, got these blondies in the oven and set up my “photography set” (if you can call it that) by the window, in our humble, little apartment. I took the Healthy Chocolate Chip Blondies out of the oven, waited for them to cool slightly and resisted the urge to shove them all in my mouth before getting a few shots of them to share with you guys. I took a few photos and then left for my afternoon run. Sidenote: I need to start following social rules better and do a quick check in the mirror before leaving the house. Once the flax egg is thickened, add the melted coconut butter, coconut sugar, vanilla extract and molasses to the mixing bowl. Stir together. Whisk in the baking soda, sea salt and tapioca starch to the wet mixture. Add in 1/3 cup of the chocolate chips at this point (it’s easier to add them in now than to add them in at the very end when the dough is thick). Add the oat flour and almond meal to the wet mixture. The dough will be thick but as you stir it altogether it will get easier to stir. Add a drop of water (1/2 tbsp) if the dough is too thick to stir (I added a 1/2 tbsp to the batter). Press the dough into the pan with the palms of your hands or a pastry roller. Smooth it out with the back of a spoon/pastry roller and lightly press 2 tbsp of chocolate chips on top. Bake for 15 – 19 minutes (my blondies took 17 minutes to bake but the amount of time will depend on your oven). They are ready when they are golden brown on top. Leave to cool in the pan for 5 minutes before moving to a cooling rack. Leave to cool for 20 minutes before slicing into the blondies to serve. Enjoy! 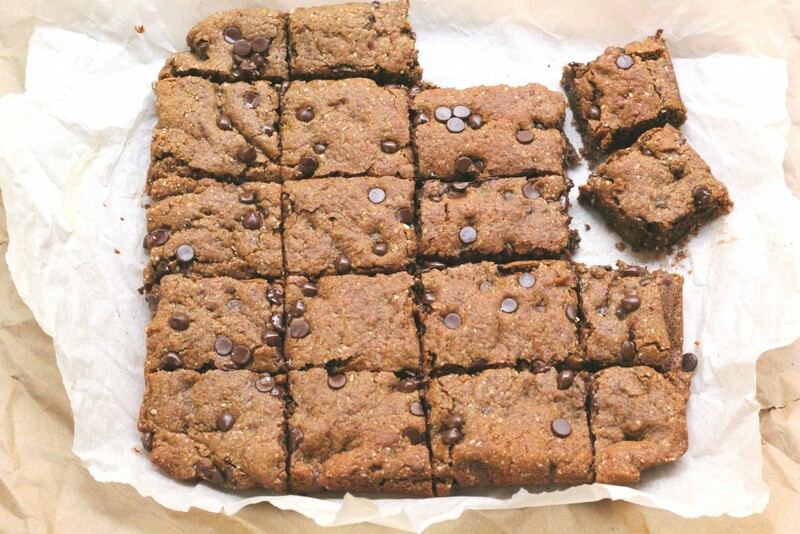 If you try these Gluten Free Vegan Healthy Chocolate Chip Blondies, I love hearing about it and seeing your delicious #CearasKitchen creations. Share your photos with me on Instagram @CearasKitchen (and remember to tag #CearasKitchen so I don’t miss it!) or share it on my Ceara’s Kitchen Facebook page. Wishing you a wonderful day!! I made these and they came out amazing! So chewy. I love that they’re healthy and still so delicious! Thanks! Hahaha. When I’m not blogging about food, I’m a potter, and I noticed during my afternoon run today that I had clay all over my shins. Oops! On the bright side, both clay and cocoa are probably good for your skin or something, right? And that is absolutely hilarious!! Clay on your shins?! You are so right, some people would pay big money for clay and cocoa treatments and here we are doing them right at home 🙂 Too funny!! Just a little note – I used tapioca, but mine is in the shape of little balls. I thought they will dissolve but they didn’t and even hardened from the baking. So that’s the only minus thing, but it doesn’t come from your recipe. I will use corn starch next time. And I’m not sure why your tapioca flour was in little balls? I’ve never had that happen to mine. Mine is a white starch (looks similar to corn starch). Corn starch works just fine in these too 🙂 Thanks again! 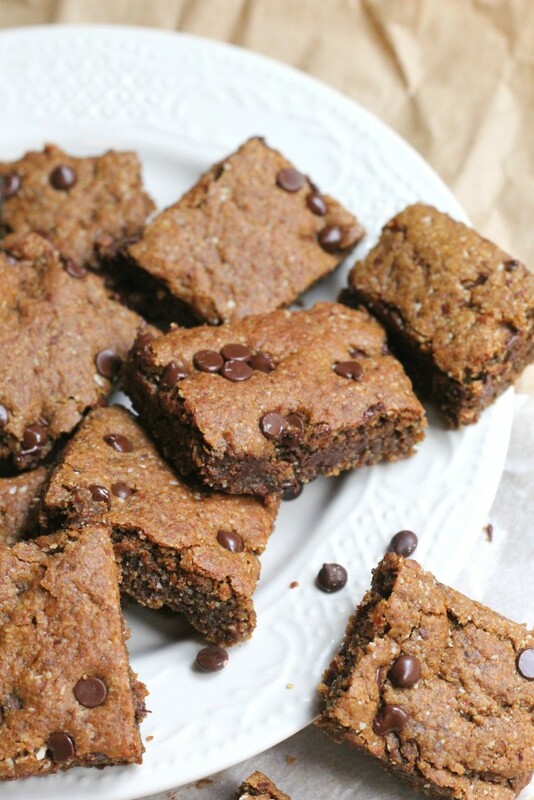 I adore blondies and these healthier GF ones are even better! Love the coconut butter in here! Wish I had some right now for breakfast! They look amazing, Ceara! These look to die for Ceara! Can’t wait to make these. Btw can I use cornstarch instead of tapioca? No clue where to get that over here. Corn starch will work just fine, Lucie!! I would love to know your results if you end up trying them!! Yay! Healthy blondies?! Say no more. I definitely need these in my life. What a beautiful recipe! These sound absolutely delicious, and I love the chocolate chips! Such beautiful photographs too!! Thank you so much, Harriet!! 🙂 Yay for healthy blondies! Wow! These look so tempting, Ceara! Would love to have them with my afternoon tea! Have a nice weekend!! Thank you, Hadia! These go perfectly with afternoon tea <3 Have a great weekend too! Oh man, I’ve been craving a dessert just like this all night long!! I’m so wishing I had all these ingredients in my kitchen right now, I would totally whip them up immediately! I guess I can wait until tomorrow when I can get to the store 🙂 I love how healthy these are! 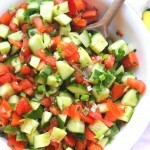 Can’t wait to see your summery salad too! <3 Yay! Thank you Izzy!! Hehe, let me know if you end up trying them! They certainly didn't last very long around here :) Have a wonderful weekend! What can you use in place of the almond meal/flour? More oat flour, maybe? Hi Elisa, I just tested and updated the recipe with a ‘nut-free version’ – you can use 1/2 cup of oat flour in place of the almond meal 🙂 Happy Baking! Would love to know your results! I love this recipe! These look so mouthwatering and delicious! The addition of coconut butter and tapioca starch is marvelous, I bet this firms up these blondies. This is chocolate <3 in perfection! Can you believe that I have never tried a blonde?! I think I need to make them for myself. Anything with chocolate chips is good, right? These look amazing! I love that you added coconut butter what a great idea. I recently made some with garbanzo bean flour and cherries, I bet coconut butter would take them to the next level! And I’ve totally been running with chocolate on my face haha. It usually goes something like this, at home baking and then I’m going to go for a run. But then the cookies come out and I have to take one bite but then I end up eating the entire cookie and then force myself out the door for the run, come home and chocolate was on my face the entire time! Hehe! Wish I could send you one 🙂 Thank yo for the kind words! They look so delicious Ceara!!! I’m drooling! 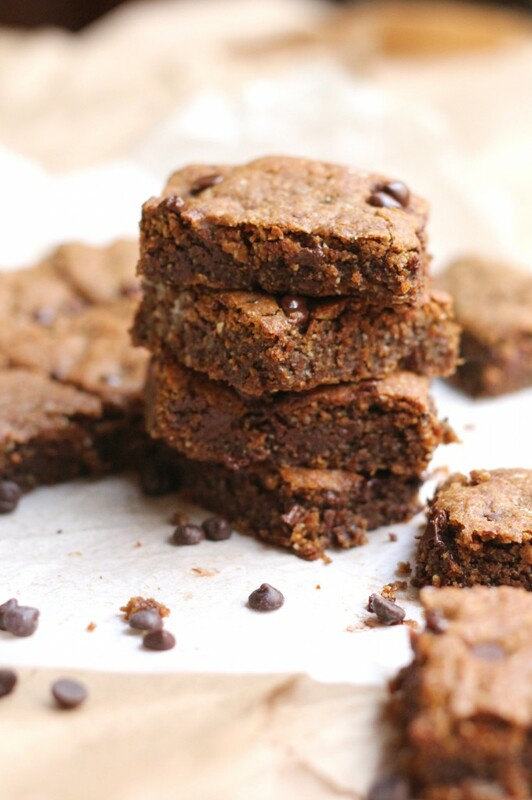 One of my favorite recipes on my bog is my chocolate chip blondies! Mine is all oat flour and tapioca though (no almond flour). I was so excited to see you use the tapioca, lol!! These look to die for and I can’t wait to try your version!! There are never enough versions and I know these are delicious, as are all of your recipes! Thank you so much, Brandi!!! I’ve been meaning to try your blondies recipe for quite some time now (there isn’t enough time in the day to try all the recipes I want to get to lol!). Thank you for introducing me to the tapioca – it’s my new favorite item in the kitchen!! 🙂 I LOVE what it does to bake goods!! xo! Love blondies, but rarely make them! These healthier ones look fantastic! I’m totally craving these blondies for breakfast, Ceara! They look absolutely amazing! I’m loving how thick and fluffy they are. Such a delicious treat, and even better that they’re gluten-free, too! Pinned! Happy Thursday, friend! Wish I could send you some for breakfast! They were my breaky for a couple days this week 🙂 Thank you for the kind words and pin! Have a wonderful weekend!